Within Cole Matthews lie anger, rage, and hate. Cole has been stealing, fighting, and lying for years. His attack on a classmate has left the boy with permanent physical and deep psychological damage and Cole in the biggest trouble of his life. To most, Cole seems beyond hope. But when he's offered a chance at an alternative path called Circle Justice, based on Native American tradition, Cole finds himself banished to a remote Alaskan island, where his rage and isolation lead him to another brazen attack. This time, his intended victim is the Spirit Bear of Native American legend—and the clumsy assault ends with Cole mauled nearly to death, desperately clinging to the life he has tried so hard to waste. Rescuers arrive to save Cole's life, but it is the attack of the Spirit Bear that is the start of Cole's long journey to accepting responsibility for his life and saving his soul. 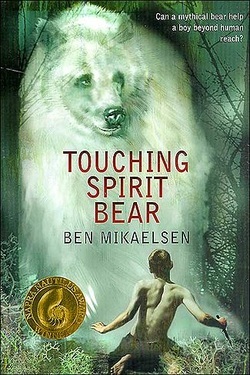 Liked Touching Spirit Bear? Check out these other books!